Hello! First post in 2 years, good to be back. Im having a issue with my 240 93mod. When i set headlight switch in position 1 (left), my low beams and marker lights work. When in position 2 (up), marker lights work fine. No problems there. When i set the headlight switch in position 3 (right), I get no lights in my headlights. Low beam is non existent, and high beam only work when i i hold back the Lever, but goes away when i release. I have tried to change the "main headlight relay" in the dashboard, but it didnt help. The chart on the new relay isnt 100% the same as the original bosch relay, but i was told it would work by the sales man. It looks like 87 and 87b gets power at the same time, like the replacement relay from ipdusa. Could it be the big step relay under the hood? First start with the fuses. Make sure they are clean and tight. Watch out for the caps on the fuses breaking and opening the circuit. Next use a test light to trace where the power to the lights is interttupted. I would start at the step relay. See that power goes in. See that power goes out to each circuit. The relay has two connectors. One with the larger wiring is for the high and low beam. One wire provides power in to the circuit. The other two are out to the high or low beam. If power doesn't go into the relay. then you can work back to the switch and relay inside the car. The step relay failed on me in my 93. They are not made as well as the older step relays. I replaced my bad one with one from an 84 that I parted out. I would check the power feeds and ground on the relay for the fog lights. 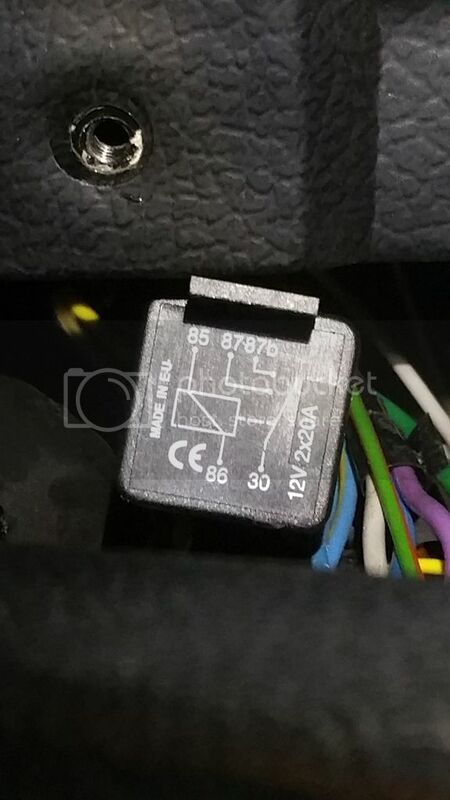 Also some fog light relays like the Hella ones have a fuse built into the relay. So you could have popped that one. Get a test light. It will help you figure out things. 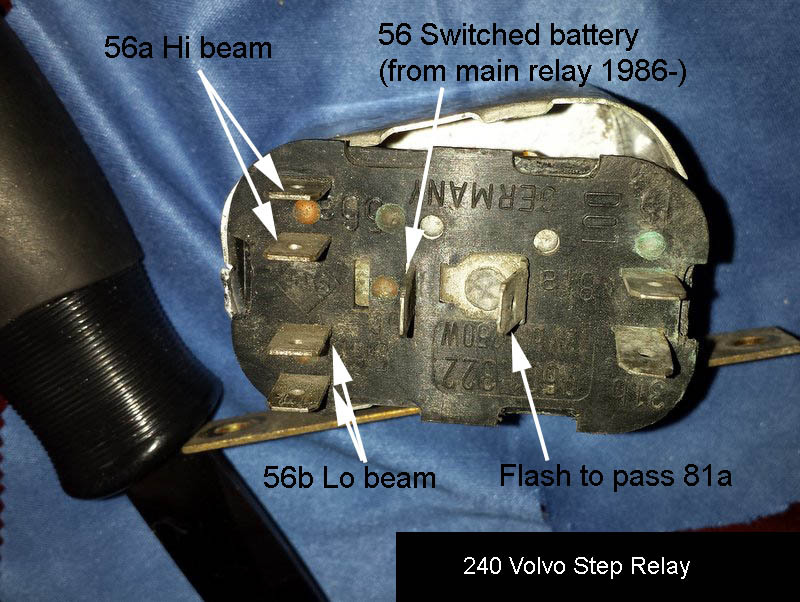 I Tested the headllight step relay, i got power into the relay, both in 1st and 3rd light switch positions. I was going to test the relay itself with a multimeter and 12v battery, but my multimeter was broken. But im pretty sure its the relay that is broken. Discovered something weird though, i got power on one of the wires going into the relay all the time, even with the key out of ignition and switch in 1st position, no idea why. I allready got one, did some testing today, i think the step relay needs changing. Tried to clean all the terminals but no difference. The symptoms *really* sound like the main relay in the dash. I guess your car as daytime running lights, which accounts for the difference in position 1 (here in the US, everything is off in that position), but other than that, position 2 and 3 act *exactly* like you are saying when the center relay isn't working properly. And it isn't really the relay itself that fails (usually) - it's just one of the connectors. They're a little underspecced when they get old they build up resistance, then they get hot in use, and lose springiness, and get hotter, sometimes warping and charring the plastic plug, sometimes just losing connection. The all the time power wire on the step relay is so you can have the headlights off and pull back on the turn signal lever and 'flash' other drivers. It turns on both headlight circuits at once. Weird, i looked at the center relay connection and it looks perfectly fine, no warping or melted points. Even put in a new relay (picture on 1st post), not sure if its the right one, but the diagram has sort of the same pattern as the original center relay. I Will take another look after work today! Didnt know you have different set up on the light switch in the US, cool to know. Cool, thanks for telling me! New update. Cleaned all the fuses and fuse box connections, looked at the connector for the centre headlight relay, its in good condition, a tiny lump on one of the connections but it works fine. Tested to see if i got power in it, and i got power in and out of the relay. However, when i held in the high beam, i did NOT see any change in what pins got power and which didnt get power, it stayed the same as long as the light switch was in 3rd position. Im guessing its the step relay that is broken, but are there other things i can check before i buy a 50$ part if it isnt needed? 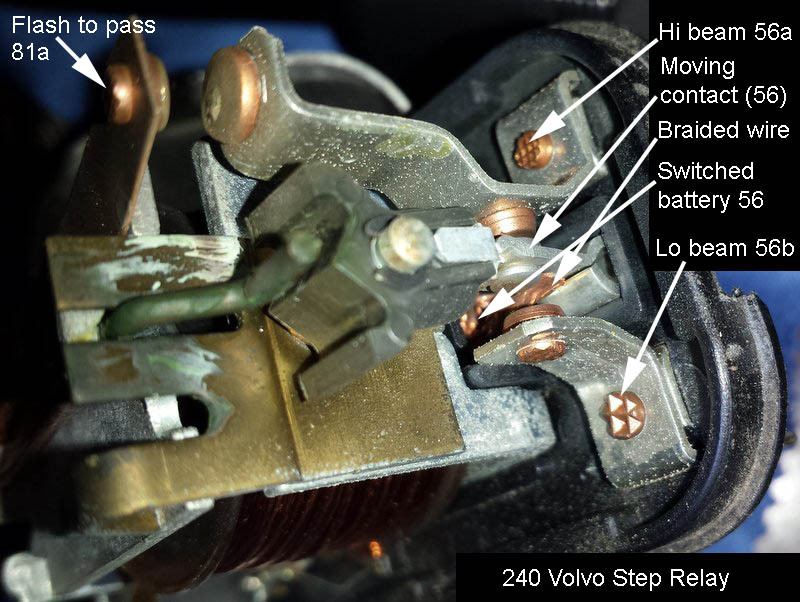 The key to deciding which part is not working is whether you have 12V on the yellow wire when the ignition switch is on (in KP-II) AND the headlight switch is positioned all the way to the right. The big difference between cars for the Sweden/Norway market and the others is the supply of the headlamps directly from the ignition switch when the headlight switch is all the way to the left. That could fool some of our guys here in the US. You can check the yellow wire at the step relay terminal 56, and if it doesn't get juice, check the other end of it back at the main relay in the dash, the one you replaced. Those are my ugly photos of the melted socket Dave Barton has decided to make famous. If you do have 12V at the yellow wire at the step relay, and you're sure the socket connection isn't crusty, the step relay is a logical reason the lights don't come on. But to confirm it, it is worth $50 to check the gray wire at 56b to be sure there's no juice leaving toward the bulb-out sensor. Last edited by cleanflametrap; 02-07-2019 at 05:26 PM.. I believe I understood your symptoms, written quite well. Let me say them back to you for your verification: Headlight switch all the way left, ignition switch on, you have low beams. No low beams in either of the other two positions of the headlight switch. High beams work from flash-to-pass switch in the turn signal stalk. Just use your test light to verify the yellow wire as noted above. Please be careful opening the relay. I almost put my oyster knife through my thumb dealing with the tabs on the ends of the relay. 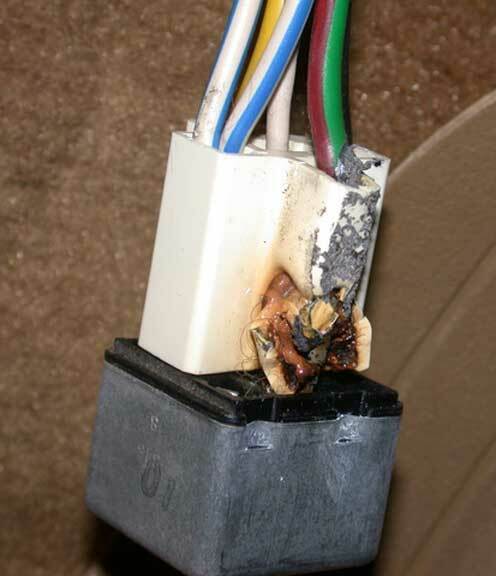 Make doubly sure the problem isn't corrosion on the external terminals before going inside. 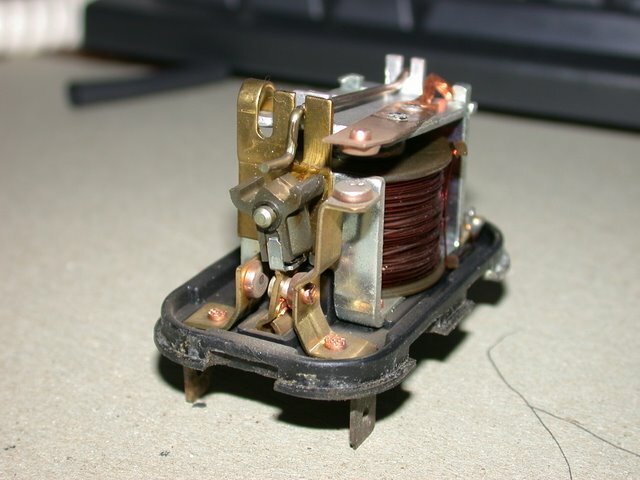 Once inside, look at the short piece of copper braided wire connecting the 56 terminal with the moving contact. If that breaks, your symptoms of having no lo or hi beam would be matched because the switched battery voltage from the yellow wire would never get to either of the two functions. If broken, that might be a good reason to drop $50.